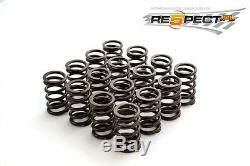 SUPERTECH Renault F4R Engine Valve Springs 16 pcs of Single Valve Springs. All Supertech valve springs are made with premium Superclean Chrome Silicon Vanadium Steel alloy for higher performance & durability at high rpms. Using high quality steel alloy allso provides the added benefit of better structural memory for all of our springs. Our valve springs are computer designed to ensure that wire stress levels do not overpass the limits of stress defined in the diagrams of fatigue. We also utalize computer software that allows us to ensure that the harmonics are under control. This combined with our high quality steel alloy enables supertech valve springs to be more durable in extreme conditions, giving your performance racing engine a serious competitive advantage in both perforamnce and durablity. WE ARE OFFICIAL SUPERTECH DISTRIBUTOR TRADE enquires WELCOME. All our parcels have online tracking. 9:00 - 16:00. The item "SUPERTECH Uprated Valve Springs Renault Clio Sport Megane Sport F4R 2.0 16v" is in sale since Friday, October 21, 2016. This item is in the category "Vehicle Parts & Accessories\Car Tuning & Styling\Engine, Tuning & Chips\Other Engine Tuning". The seller is "kidzio" and is located in Mroków. This item can be shipped worldwide.